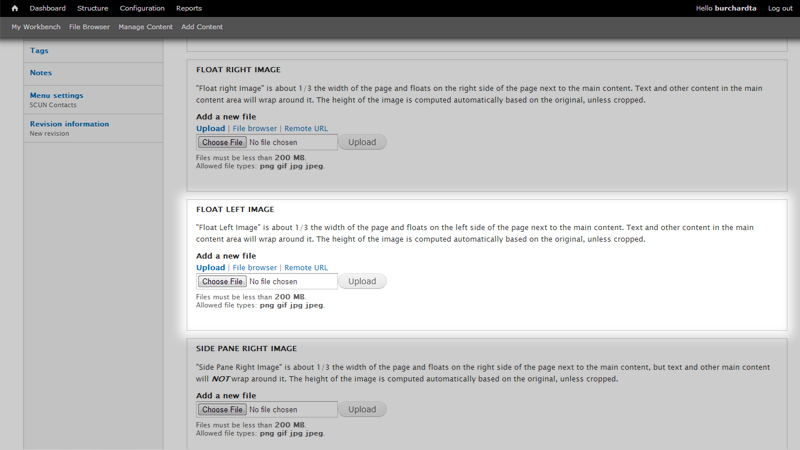 How do I add a "Float Left Image" to my web page, and what are the benefits of doing so? The Float Right Image can be used in articles or biographies to enhance the reader's experience or to create a more interesting page layout. The image will align to the right side of the page and any body text will wrap around the left side of the image. This type of image could also be useful in creating a three-column layout design. Click on the Images tab in the side menu of the Edit Page screen. Scroll down to the field titled "Float Right Image." Save the changes and publish the page. For a more in depth explanation of this process please take a look at the Video Tutorial provided on the Web Development page.